Tis the Season for Baking… and Chemistry! Pumpkin pie, gingerbread cookies, apple dumplings… with the start of fall comes the start of the baking season. Most of us will indulge this week and weekend on baked goods of sentimental value that we have enjoyed maybe every Thanksgiving of our lives. As a nutrition science nerd, I wanted to share a bit of the baking chemistry that makes those sentimental sweets so satisfying. Baking is a science, with the correct proportions of flour, leavening agents, eggs, fats, sugars and liquids needed for a successful, finished product. The next time you’re baking a birthday cake for a friend or making Christmas cookies, I hope you remember the following lowdown on basic baking ingredients and pat yourself on the back for being a kitchen chemist. In baked goods, flour provides structure. Flour contains protein (more specifically, glutenin and gliadin in wheat flour) and when flour comes into contact with liquid, the proteins bond together to form gluten. We see this happening when a cookie mix becomes thicker after combining dry and wet ingredients or when dough being kneaded becomes more textural and elastic. Eggs act as an emulsifying and binding agent during baking. The egg yolk provides moisture and serves as an emulsifying agent, keeping all ingredients evenly dispersed to form an even texture. In vegan baking, or for cooks looking to lower cholesterol intake, an emulsifying agent must be added in place of the yolk. Examples include ground flax seed simmered in water or applesauce. The egg white, which is full of protein, contributes to the final structure of the product. When heated, the proteins denature and work as leavening agents. Examples of leavening agents are air, steam, and CO2. These agents help the product rise and take shape. The most common recipe ingredients one will come across that produce the leavening agent CO2 are yeast, baking powder, and baking soda. In bread dough production, yeast is added to feed off of sugar and produce CO2, causing the dough to rise into a shape that can be baked. Yeast is a biological source of CO2 while baking soda and baking powder are chemical sources. 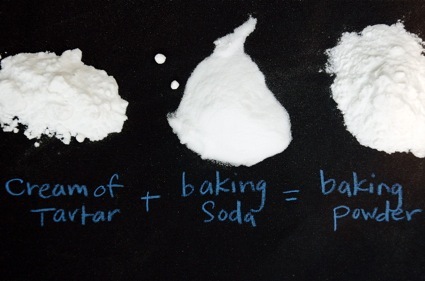 Baking soda is a dissolved alkaline compound which produces CO2 when placed in contact with an acidic ingredient, such as cream of tartar or lemon juice (hence the need for the random spoonful in many cookie recipes)and a liquid. Baking powder is a mixture containing both dissolved alkaline compound and an acid salt and is used in recipes where no acidic ingredients are present. The addition of sugar not only adds sweetness, but contributes to the browning of a product as well as the tenderness. During the baking process, sugar inhibits the formation of gluten. For this reason, cakes are far more light, fluffy and sweet than bread. Liquids help promote gluten formation, carry flavors, and can act as a leavening agent. Variations in liquid additions can either promote or inhibit gluten formation. Liquid can act as a leavening agent when it changes to steam during the baking process, forming air pockets within the product, causing it to rise. Salt addition plays a role in gluten formation and enhances flavors during baking (especially chocolate). The ions in the salt help line up gluten fibers, giving bread a better texture. This entry was posted in Food and Recipes and tagged baking, James Madison University, nutrition, UREC by foodurecognize. Bookmark the permalink.